My husband and I finally took proper pictures of this dress I finished last year! This was my favorite dress I made last year, and it’s my first dress from the 1880s that I’ve made that I’ve been happy with. I posted previously about making this dress here, here, here, here, here, and here. I also posted the hat here. This was one of the largest personal projects I tackled this year, second only to the white Tissot inspired dress that I’m hoping to take pictures of tomorrow (or soon, anyways). 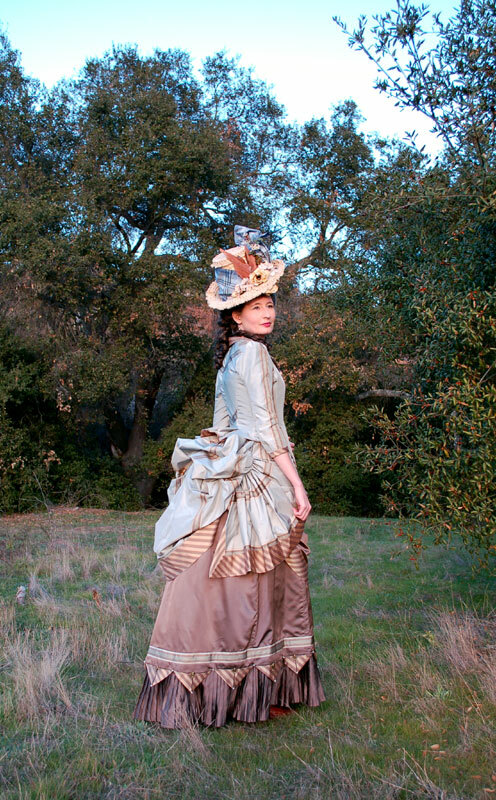 To recap on patterns: I used the Truly Victorian Wash Overskirt pattern, the 1885 Truly Victorian Four Gore Underskirt pattern, and I kind of miss-mashed several different Truly Victorian bodice patterns to make the bodice. Of course, the patterns were modified to suit what I wanted to do. The underskirt pattern was shortened and then made to have the points and I attached the pleating under that- but I think I wrote about that more in previous posts. The excuse to make this outfit was to wear to Costume College, an annual costuming convention held in the Los Angeles area. 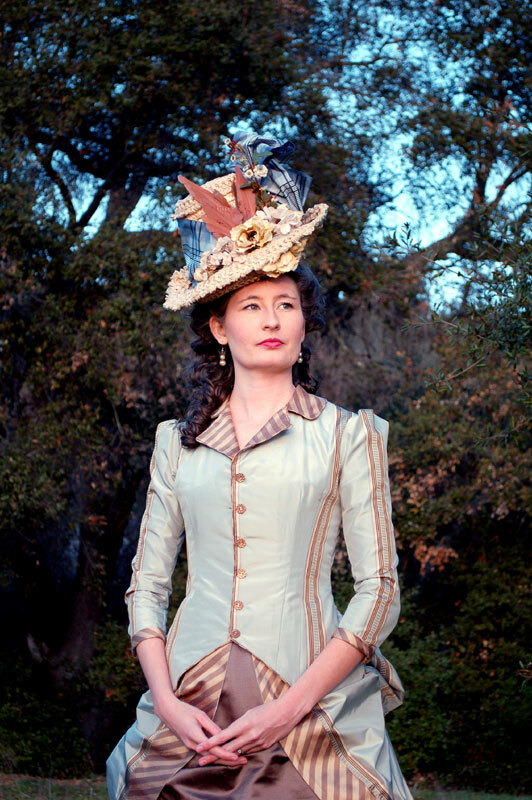 I’m glad I had the excuse, as I always am most happy with the historical sewing projects I make during the year, and I don’t always attend enough events or do any flitting around the house in 19th century attire. The dress was a combination of a bunch of fabrics, all from out of my stash and bought as remnants here and there, aside from the silk that the skirt was made from which I found for a shocking $3 a yard in the garment district in LA! My big splurge on this was the blue striped silk taffeta, which was a whopping $5 a yard. The dress just kind of came together after all the fabrics had a few years to mingle together in the stash and inspiration decided to strike. This hat is SO much fun to wear, but it is an awful bear. It makes me stand up tall in order to keep it on my head! lol! I still need to fine tune my millinery skills- I have a tendency to make hats a little too small in circumference- especially after I add a period hairstyle or wig. I know it’s a little big and a little over the top, but it’s FUN. I like big hats with lots of stuff on them. We had so much fun taking the pictures! The dress is so fun to wear and makes me feel pretty and fancy- like a heroine in a BBC period drama :) So, of course, I’ve got to add some silly shots to the end here of my oh so period correct socks, and just being silly. I love it! And your hat is just fabulous! I so want to get more into millinery. Amazing work! I love all the beautiful details you put into this dress. Congrats on finishing such a big project. I love seeing all your hard work. Gorgeous!! That has is pretty fantastic too! I know Ze-Ro about fashions before 1910 or so, but love seeing them made up; they’re great eye candy and you did a beautiful job. Where did you get your shoes? Should read ‘hat’, not ‘has’. Thank you! I bought them on Sheplers.com but they don’t seem to have this style any longer. They are the Oak Tree Farms Catherine boots. I really love them, but they are a tad on the narrow side, even for my narrow feet. I took them to a cobbler and had them streched across the ball of the foot and now they fit great. I also wear them with insoles as there’s no padding, but they’re the most authentic Victorian boots I’ve run across so far- no side zips! I had forgotten about Shepler’s; Thanks for the reminder! Wow, you look great! I’m very impressed with your use of stripes – they always fight me. Absolutely fabulous. Why don’t you go flitting around Old Town San Diego, you’d fit right in with those Victorian houses on the hill! Wow, this is amazing! I have always wanted to have a dress like this. Sadly, I would have no where to wear it, so it would be a lot of work for a blog photo shoot. These photos are lovely and I am sure you will have a grand time wearing this at Costume College. This is just amazing and the colors are lovely. A big success! This is STUNNING! The colors, the stripes (I love stripes! ), all the detail are spot-on. I hope you have many more opportunities to wear it. And that hat is a work of art. Accessories can be so much fun, including bright green socks! It’s gorgeous! And the second pictures is so suggestive and lovely, though all pictures are very nice indeed! Your gown is absolutely gorgeous!! :) I love the combination of colours. These photos are STUNNING! I just absolutely adore the second photo and you definitely look like you just stepped out of a BBC drama!! What an amazing accomplishment!!! It’s gorgeous! Thank you for giving me something to drool over since I never get any historical costuming play time anymore! Amazing! You look stunning! :) It gives me motivation to work on my own sewing! (though it’s not nearly as complex lol). A beautiful outfit, from my favorite fashion period. But I’m perhaps *more* intrigued by your final sentence… “I may have possibly started sewing an 1869 underskirt last night….” Please, if it turns out you were sewing something else, do let us know what it is! Thank you! Hehe! Yes, I’m sewing the Truly Victorian 1869 Grand Parlour skirt right now to complete an ensemble I started over 5 years ago! Yay! Proper photos! The dress works so perfectly with the California winter colours – it really does look like a BBC drama. It’s absolutely gorgeous! Stunning! I’ve been anxiously awaiting seeing this particular ensemble finished! I do have a question about your boots…I have been considering purchasing a pair for myself but heard they’re uncomfortable. How are yours working out for you? 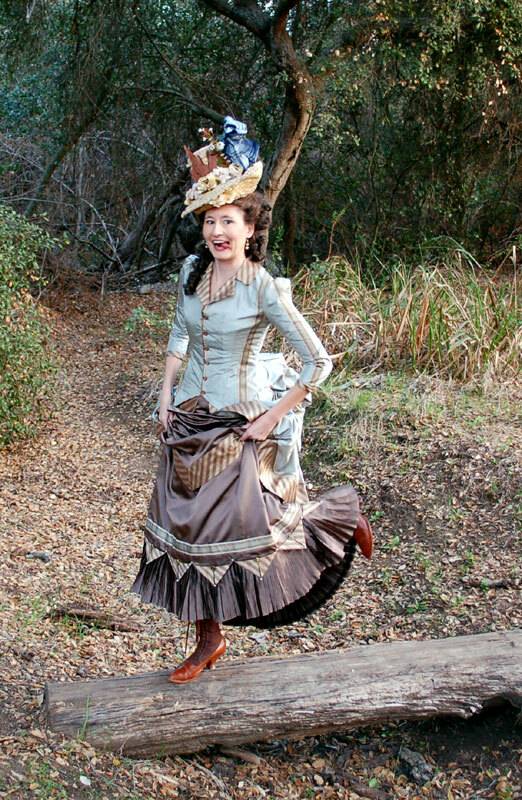 I’m hoping to be able to construct my first bustle gown sometime later this year and am dying for a pair of those boots to go along with it. I have very narrow feet, and when these arrived they were too narrow even for me. I took them to the local shoe repair shop and had them stretched just across the ball of the foot and now they fit perfect. Oh, I wish there were more occasions to dress like this. Today’s fashions are so much more — practical, and simplified, which has its own beauty, but I am more of a fancy frou-frou girl, and would love to dress like this! I am so glad you share with all of us. Beautiful, I had been wondering if you had finished it. Wow, you’ve done such a great job on this dress! I remember reading your previous posts so it’s great to see it finished. Love the socks too! Such a gorgeous gown!!! You look beautiful! You look amazing! Very impressive. Lovely! 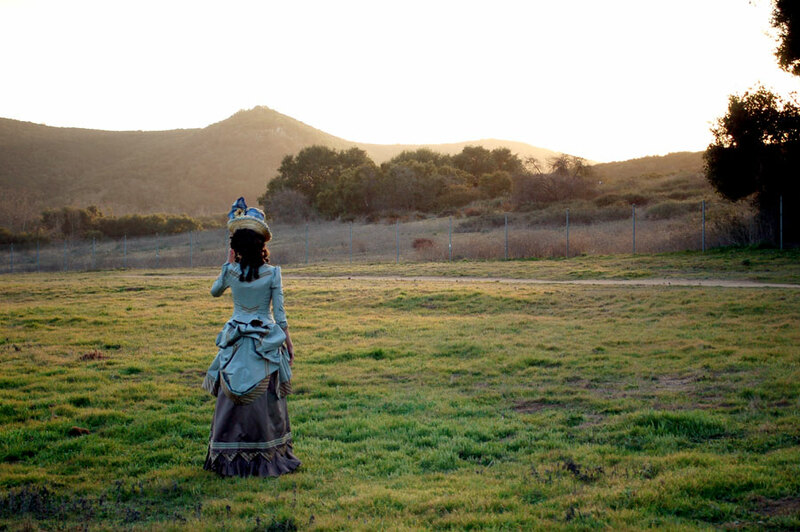 You look just like a Victorian lady of the era, and your dress is beyond beautiful. Oh my word! > O < I am in awe of your sewing skills Lauren, your dress is amazing and looks so fantastic on you! I love your 'big' hat too ~ I think it's perfect! Oh my goodness that is truly incredible! And the hat is fantastic! Wow. Wow!!!!!!!!!!!!!! This dress is amazing, I just looooove it! I have always wanted to make a Victorian dress, I even have a place in mind to wear it, I just need to do some research and get stitching! You have so inspired me to try this. The details and the colours that you have chosen are perfect and the hat is amazing, well done! It is so great of you to share your talents with us all! 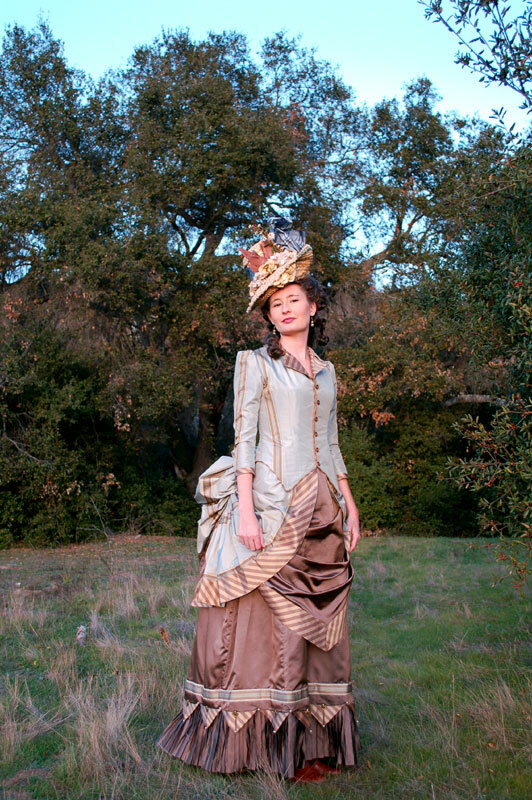 I love that you are so passionate about historical fashion and it is great to see it recreated in this day and age. The dress came together and looks great. I look forward to coming back to your blog.